Recent snowfall in the Ochocos has turned what was once a dismal mountain snowpack into one that should enable irrigators to endure another dry year. Staff from Ochoco Irrigation District recently took visits to three different SNOTEL sites in the Crook County area late last week. After taking snow depth and water content measurements, they learned that snowpack is actually at or slightly above the historic median and well above the totals from this time last year. At the Marks Creek Snow Course, about 25 miles east of Prineville off U.S. Highway 26, the average depth is 4.9 inches, compared to 3.4 inches in 2018. 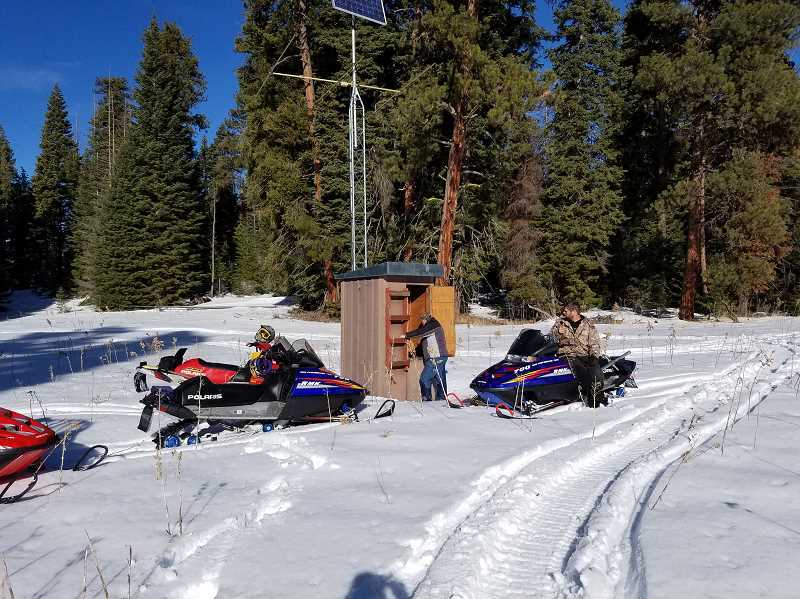 Snow depth is 28 inches at the Ochoco Meadows SNOTEL site near Walton Lake, a vast improvement over the 2018 depth of 15 inches. Water content this past week was 9.8 inches compared to just 5.5 inches the prior year. Similar results could be found at the Derr Meadows SNOTEL site near Mitchell, where a snow depth measurement of 31 inches was recorded compared to 17 inches in 2018. Water content for 2019 was 10.8 inches, nearly double the 5.5 inch total in 2018. This was pleasing news for OID Manager Bruce Scanlon, noting that it will help the district weather what figures to be another drier-than-average year. Not only will the district likely enter the irrigation season with emptier reservoirs than the previous season, the lack of snowfall at lower elevation has left the ground drier than usual. "We are at such a deficit that we have to recharge the groundwater before we get the level of runoff that we want to see," Scanlon said. While that is the case, he went on to note that the snowfall in town this past week "is going to help immensely with the ground saturation." OID staff will continue to visit the SNOTEL site and collect readings into March and April, and that data will help them determine how much water they can expect in the Prineville and Ochoco reservoirs during the upcoming irrigation season. "If we get more precipitation, we may get closer to fill," he said. However, a look at the drought monitoring for the state reveals that Crook County is among the driest counties in Oregon, and Scanlon notes that long-term weather projections from Natural Resources Conservation Service and the National Weather Service still call for drier and warmer-than-average weather conditions. Water allocations will likely be determined by the OID board and staff some time in either late March or early April. Scanlon said those allocations could be curtailed from what OID provides during normal years, but the recent snowpack data provides some room for optimism. "Right now, signs are good that we will be able to withstand what looks like another dry year," he said.